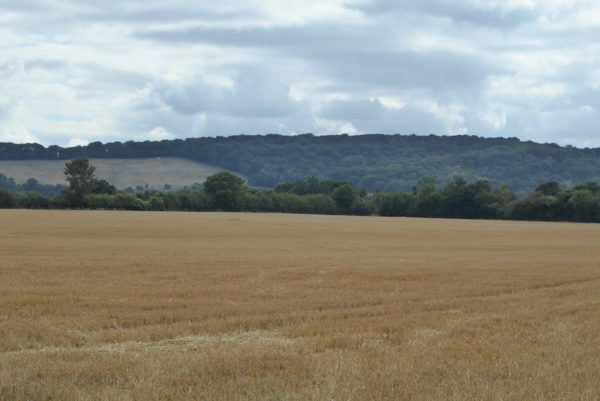 When staying at Cholsey Grange we rarely get in the car to head for a walk, but today we are making the short trip over the hill to the village of Chinnor from where our ramble will commence. 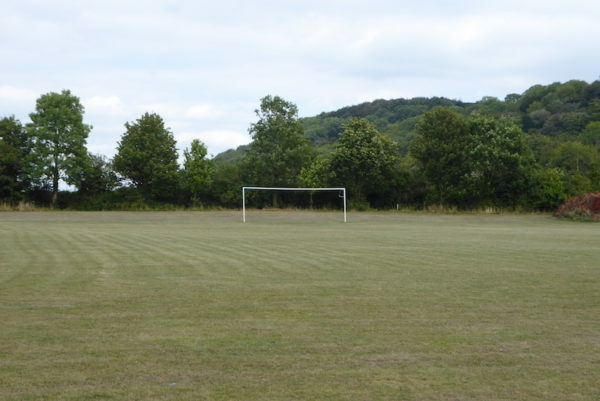 We park close to the Chinnor and Princes Risborough Railway and walk through the car park to a road where we turn right to walk up Hill Road, going past a roundabout and then taking a footpath sign on the left which enters a playing field. Keeping to the edge of the field we continue with the road the other side of the hedge until we meet the Ridgeway National Trail. Here we turn left. 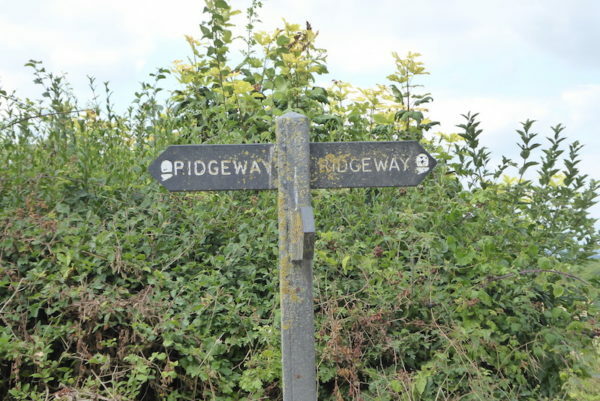 We have previously walked parts of the Ridgeway but not this section. This National Trail covers 87 miles from Ivinghoe Beacon to Avebury and follows what is said to be Britain’s oldest road used by travellers for at least 5,000 years. Our tree-lined route is clear and easy to follow and we stay on the Ridgeway until we reach a fork of paths at Hempton Wainhill. Here we go left leaving the Ridgeway to follow the Midshires Way towards Bledlow. Now out of the trees we have wide ranging views across the valley. 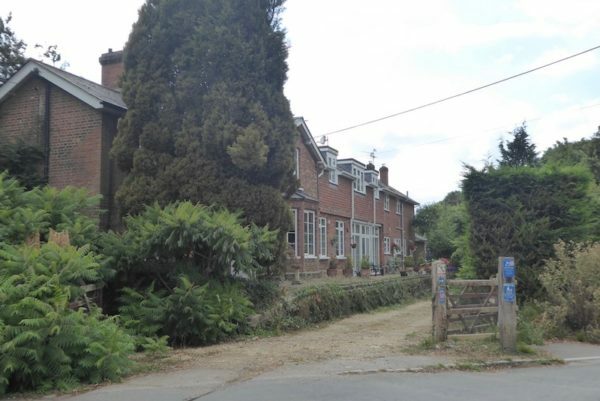 As we approach Bledlow we take a footpath on the left towards the edge of the village where we join a road and walk past the 16th century Lions pub. Continuing along the road we reach Holy Trinity Church dating mainly from the 12thand 13thcenturies. After passing the church we turn left on a footpath besides a stream and pass cottages before crossing what is shown on the OS map as the Icknield Line Steam Railway, Stop, Look, Listen! This line is now the Chinnor and Princes Risborough Railway, run by volunteers. Originally built in 1872 for the Princes Risborough to Watlington Railway Company it ran passenger services until 1957. Freight continued to use the line until 1961 after which the track between Chinnor and Watlington was lifted. 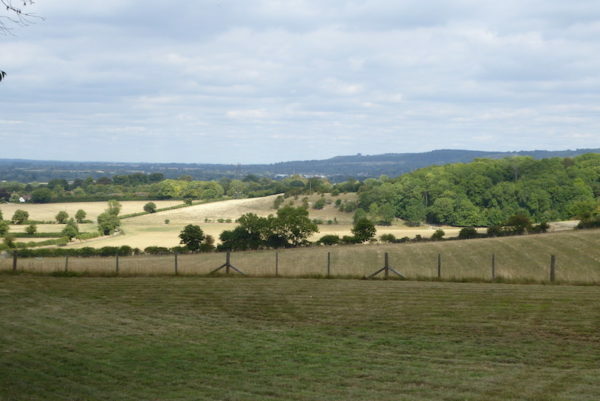 The track between Chinnor and Princes Risborough was retained to serve the Chinnor Cement Works until 1989. 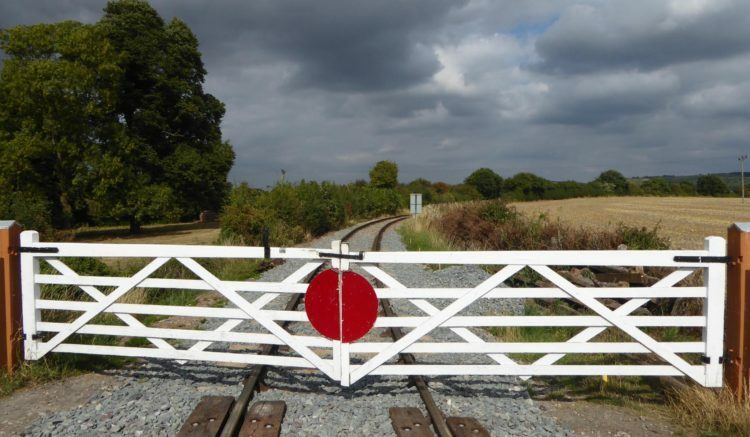 After its closure the line was passed to the Chinnor and Princes Risborough Railway Association who continue to run excursions. The path continues through fields and then at a junction of paths we turn right and head across more fields to reach Pitch Green. Here we join a lane and turn left heading straight across the B4009, then follow the lane through Pitch Green until we reach the disused railway. Now we turn right and follow the path along the route of the old track bed. 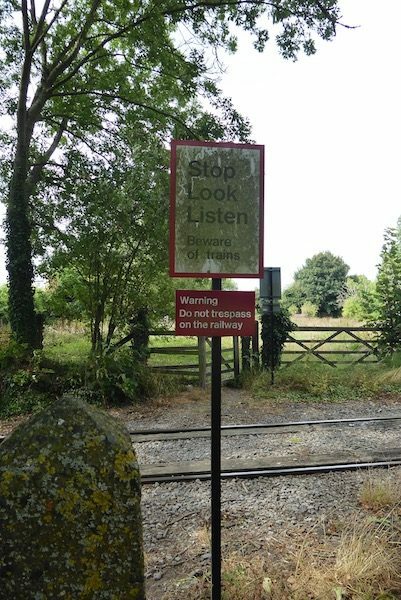 Soon a bridge takes us over the B4009 and we turn right onto a footpath that crosses the railway line. 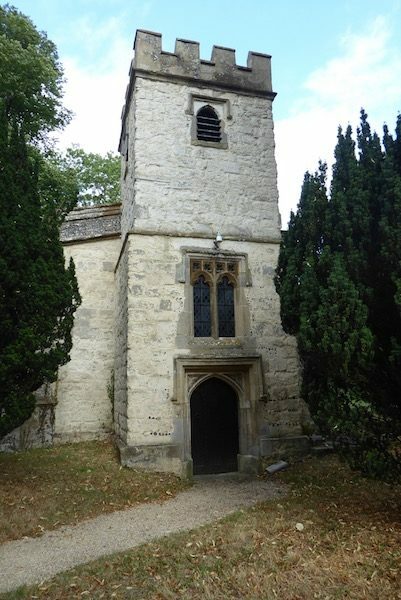 The footpath leads into the hamlet of Horsenden where we stop to look at the 15thcentury St Michael and All Angels church; unfortunately it is locked. 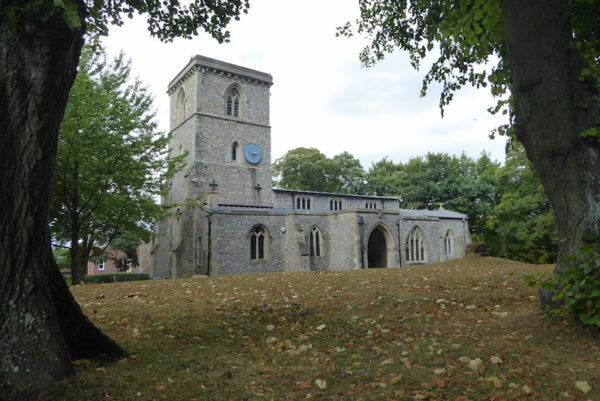 According to the website this church holds an interesting place in medical history. The then rector, Edward Stone, discovered that chewing willow bark helped his rheumatism. In 1763 he reported his finding to the Royal Society and it was later discovered that the active ingredient was salicylic acid, which is now better known as aspirin. Our route continues south westerly across a couple of arable fields to join a junction of paths where we turn left and follow a hedge-lined track before turning left on a footpath close to Frogmore farm. Where this path forks we keep right crossing a minor road to continue through fields to reach the Bledlow Road where we turn right and then at the crossroads turn right again. 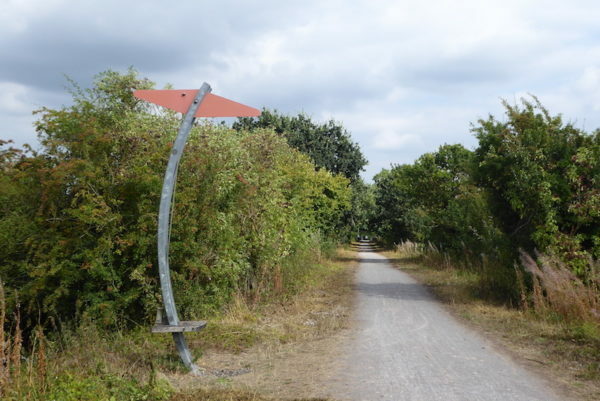 We are back on the Ridgeway and Icknield Way Trail. 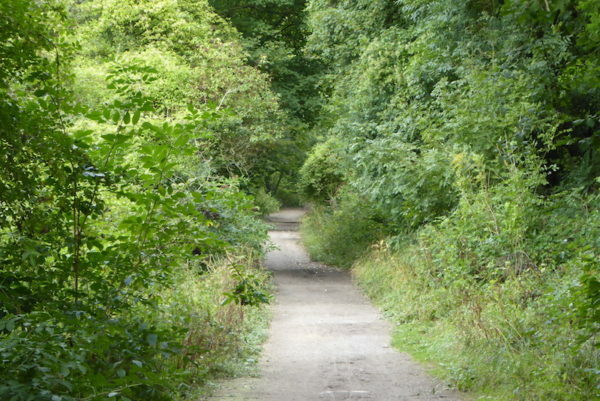 The path follows along the road to reach a T-junction with Bledlow Ridge Road. We go straight across on the track and gradually head uphill to reach the edge of Thickthorne Wood. We leave the main path to follow a well-worn route on the left climbing gradually through the trees. 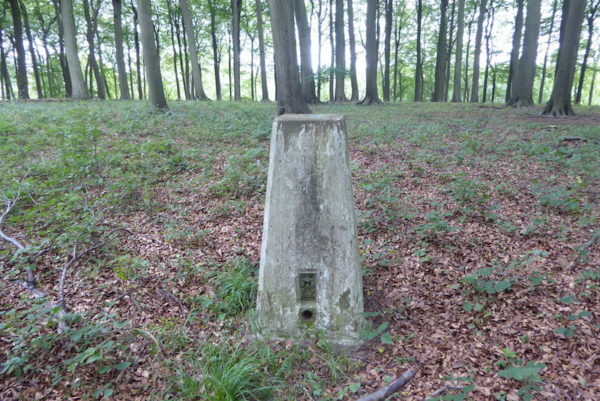 As we reach the top of the hill I take a brief diversion from the path to visit the OS trig point at Wain Hill, number eighty-seven “bagged” for me. 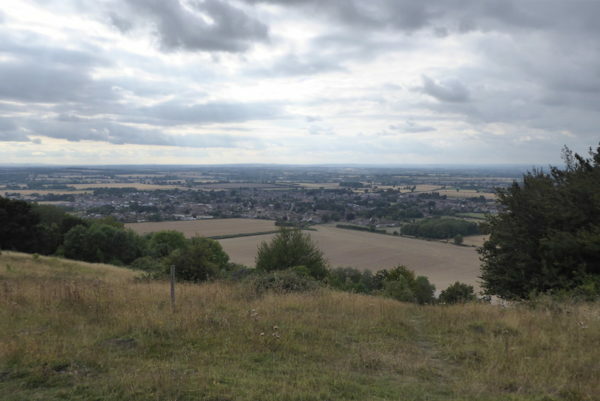 Back on the footpath we head along the top of Wain Hill and then enter the Chinnor Hill Nature Reserve with its stunning views across the valley. Our path brings us to a minor road that we follow for a short while before turning right on a path heading steeply downhill to rejoin the Ridgeway path where we turn left and retrace ours steps back to the car park, stopping briefly along the way to look at the quarry for the old cement works. It is difficult to imagine this once major industrial site that was started in 1908 by William Elijah Benton to produce lump lime for construction and agriculture. In 1919 he added a cement works. 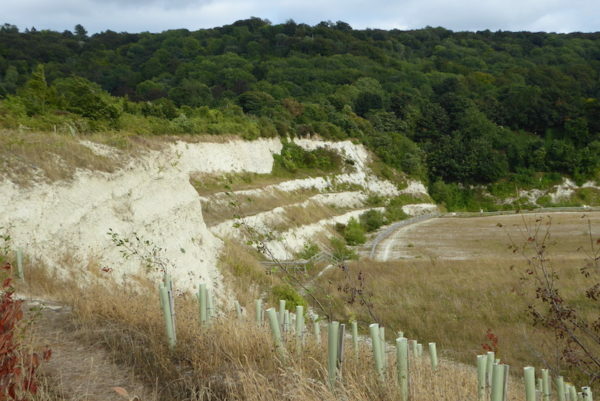 At its peak chalk was being quarried at 400,000 tonnes a year to make 225,000 tonnes of cement. The works closed in 2000 and the site has been redeveloped for housing. Back at the car we have covered just over nine miles. It has been a warm afternoon and we are all keen to head back to Cholsey Grange for a refreshing cold drink. There are so many beautiful places to visit in the UK and it is a while since I have been to that part of England. 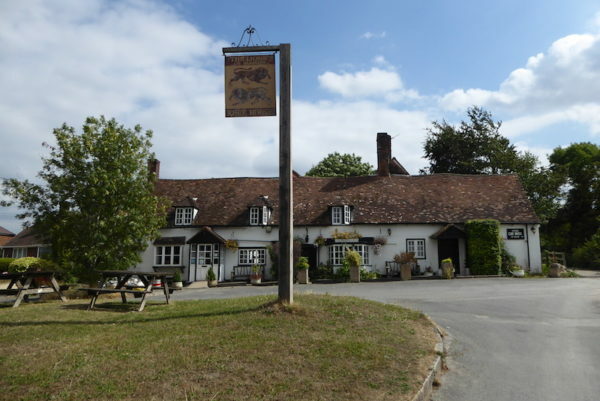 Your photograph of the pub reminds me of the image I get in my head when reading a book that mentions a village square. Great photographs that highlight the beauty and diversity of the area. 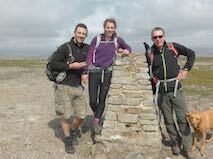 Thanks for the comments, it is a cracking place to walk. Good job here! Looks like I’ve actually noticed you around Chinnor. But who knows, lol, it could be any other hikers with their dogs. Thank you for your comments. 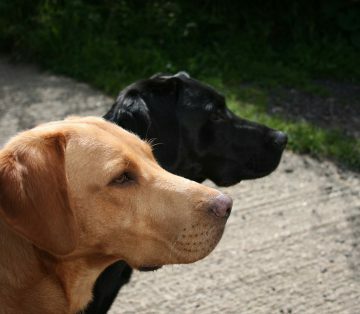 We really enjoyed our walk from Chinnor. Say hello next time. OMG! Nine miles!! I am definitely motivated to do at least half! Hehehe. I can’t imagine walking that long with my dog without her causing a scene. She’s gets restless when we walk for long and can begin to throw tantrums, if that’s even possible. Lol. Thanks for the comment. It’s not how far or how fast that matters, getting out and enjoying the countryside is the important bit.